RollerCoaster Tycoon 4 was a cynical thing, laden with microtransactions and Facebook tomfoolery. It was the kind of mobile game that makes people go “ewww, mobile games”, but Atari promised that the PC version would be different. The publisher revealed this new version at Gamescom today, and yep, it’s different. Different name, different developer and no microtransactions. 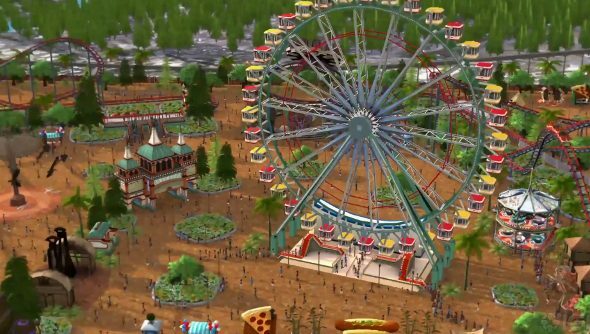 RollerCoaster Tycoon World is due out early next year. Pipeworks Software is at the helm. They made a bunch of Godzilla games years ago, and their last finished game was some Dancing With the Stars browser game. While microtransactions have been shed, social stuff remains a big part of it – but it sounds like it’s less about pestering people on Facebook and more about sharing blueprints and visiting parks created by chums. There’s a multiplayer mode too. If your pal can create rides designed to kill better than you ever could, but you’re rather good at taking money out of the pockets of patrons, then you can team up and build a park together. Up to 4 players can band together. And luckily for Pipeworks, the bar for new RollerCoaster Tycoon games has been set really, really low.